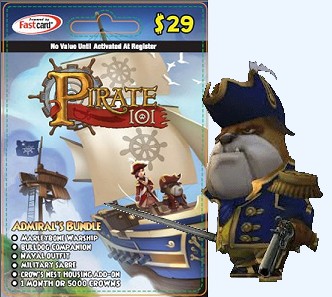 KingsIsle sent us 2 Admiral Bundle Codes to give away to 2 lucky fans. A $29 value! It’s our very first contest give-away! This promotional version does not come with additional crowns. Thank you KingsIsle for the give away prizes! Follow the instructions below to enter. We will select 2 winners at random on Nov. 23, 2012. We decided to change our drawing date for the day before Thanksgiving so winners would have the entire holiday to play with their new prizes. We’ll randomly pull the drawing on Wednesday at 12noon eastern; Nov. 21, 2012. It’s our first prize give-away..we’re learning! And tell us which item in the bundle you’re looking forward to the most! hello. i dont get the way how you enter?. where do i send my entry? Click the link in the post. The one that says “email”. Thx for the raffle. Good luck everyone!